This is what one of the members of the group said to me in the past several days. 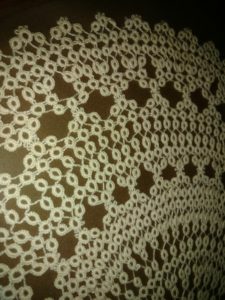 What could be more enticing than a simple project that can be completed in just a couple of hours – for the faster tatters, or in a day if the tatter is more exacting, uses smaller thread or is just one who tats slowly. They have endless variety and are open to every variation known. Lizbeth metallic thread in red and white with translucent white drop bead. Note the addition of beads and floating rings. These elements add a touch of complexity of design while the metallic thread makes the entire piece sparkle. I think we are all still working on our favorite Ice Drop patterns. I really like how the Lizbeth Metallic thread works up in general. It’s just challenging to deal with as it comes off the ball. I think it’s because the thread is stiffer than cotton that it wants to unroll off the ball all at once. Thankfully there are the tread balls and small mesh bags that help hold the tread, whether you are using the ball thread directly in your pattern or if the ball is simply waiting for the next amount of thread for your needle or shuttle. These keep the thread from unwrapping too quickly as the tatter works, but also serves to keep the thread free of dust and other particulates. 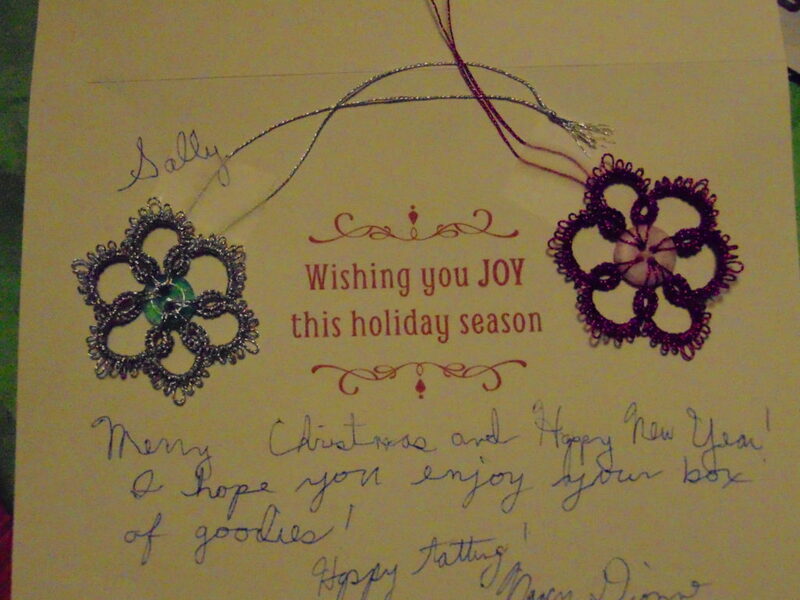 One of the most popular new patterns taking the tatting world by storm is Diane Cademartori’s “Ice Drop” pattern. The pattern’s popularity took its creator by surprise according to what she said when I spoke with her in 2016. A striking way to surround a simple glass drop bead with tatted rings and chains, decorated with additional chains and beads or with a variety of decorative threads arranged in variations ranging from Diane’s initial pattern to the complex patterns that have grown out of that first effort. 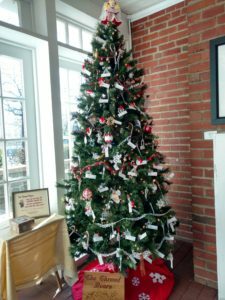 Thread Bears believed that such a simple pattern would be the perfect addition to the other ornaments we have prepared over the years for the benefit known as Deck the Trees at the Monte Vista Hotel in Black Mountain. So as a group, we undertook the mastery of the pattern and its variations. This example was created using Altin Basak thread size 50 in the color 1351 – a gold cotton thread with gold metallic thread spun with it. 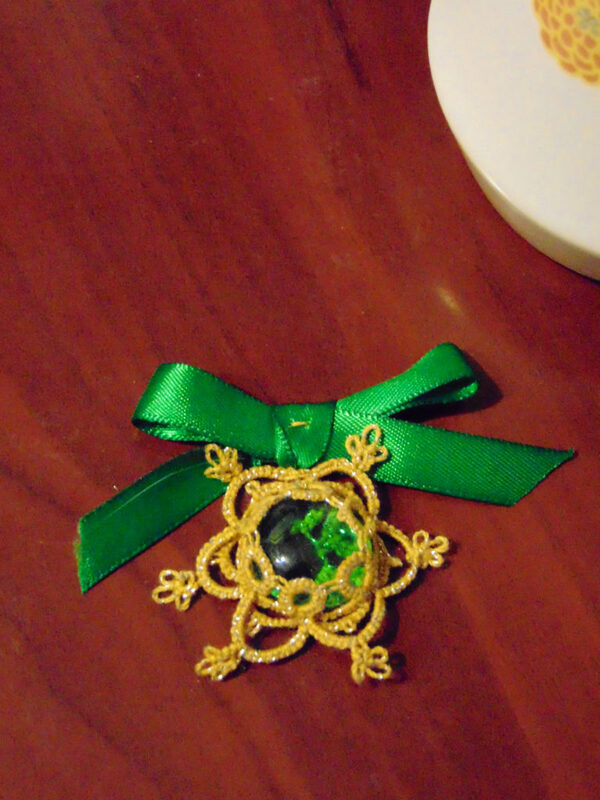 The tatting surrounds a green glass bead that is 18 to 20 mm in diameter. There’s nothing like a little bling added to the holidays and the glittering gold adds something that would make the green of the glass drop stand out against the green of the trees. 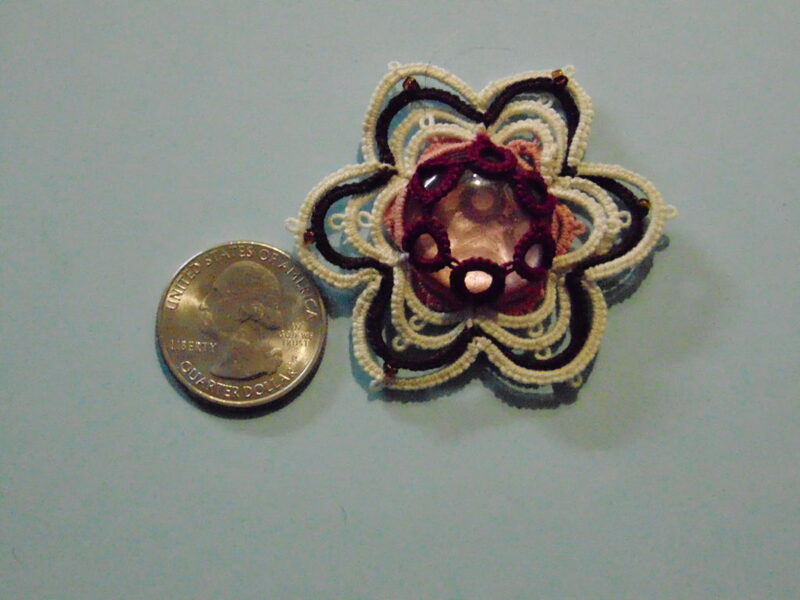 This is another small Ice Drop made with Lizbeth size 20 in solid colors ranging from Cream to Burgundy to Fudge and Medium Coral. We will be continuing our lessons in Ice Drops for the next several weeks. 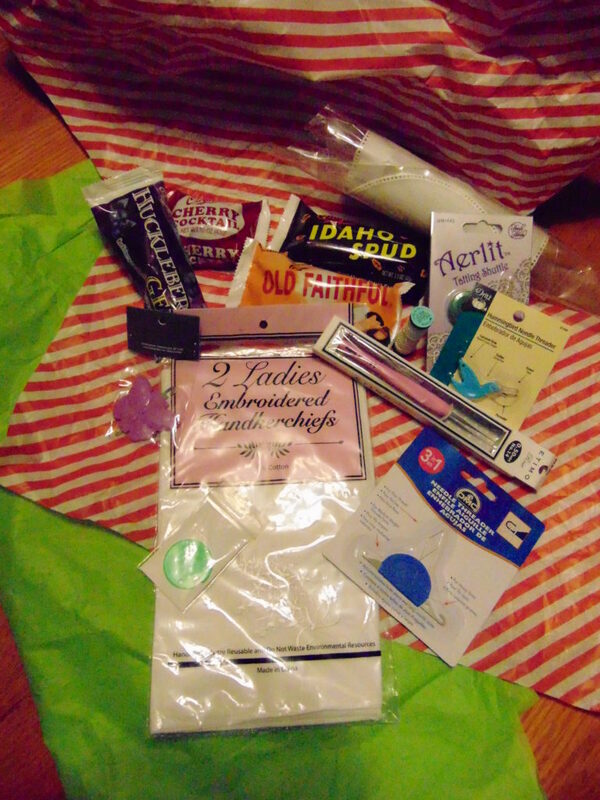 For the first time in many years, I elected to participate in the Secret Santa Exchange sponsored by Lisa Adams’ Tatting Corner in Chesterfield, Indiana and frequent vendor for Tat Days in Toccoa, GA. Nancy Dionne from Idaho turned out to be my Santa Pal and what a pal she is!! The first think I found was her card. You have to know that my first thought centered around our Deck the Trees and ornaments for it. These would be perfect additions to our now 8 year collection! 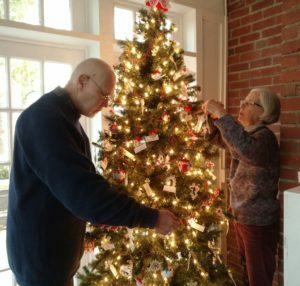 I hope Nancy will approve since this year – so far – the trees at the Monte Vista have raised MORE than $24,000.00 for the Christian Ministries Fuel Fund. These are lovely Snowflakes created with buttons & metalic thread and will be beautiful additions to the tree in 2019. What followed was sheer delight! There were several different types of needle threaders – some I had never seen before! Additionally were 2 embroidered (white on white – how elegant!) 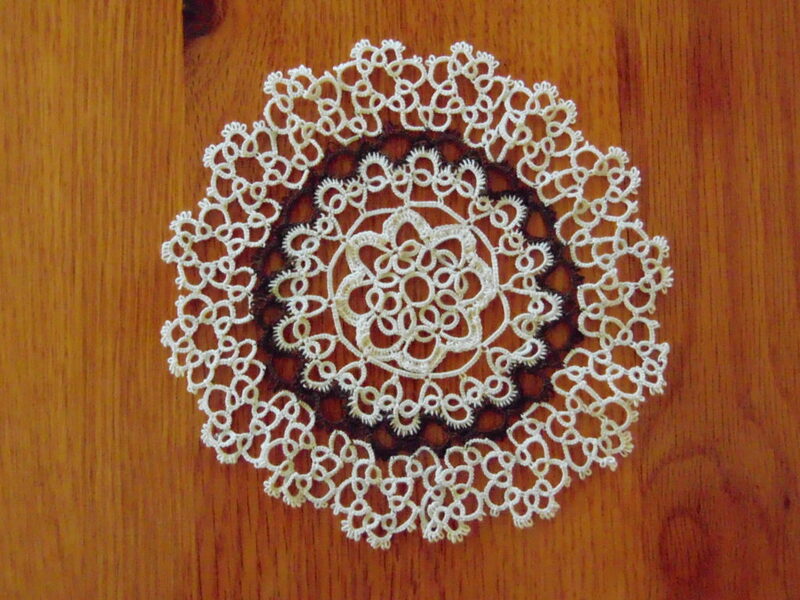 ladies handkerchiefs and a fabric doily center for tatting a scalloped edge around. 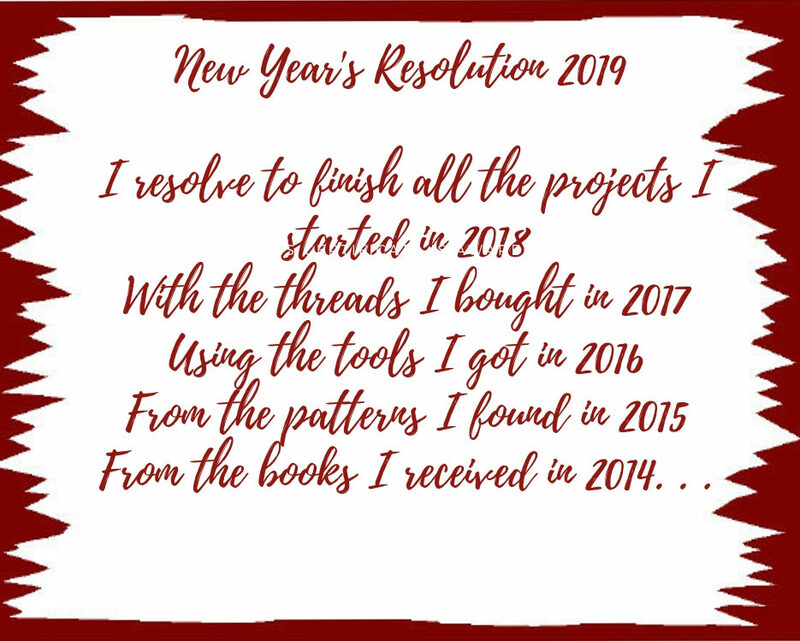 There was also a #14 crochet hook, an Aerlit shuttle and bobbin as well a my favorite jewelry thread Kreinik, made in Parkersburg, WV – hear my home town of Clarksburg. Obviously I’m going to have to locate appropriate edgings or design some new ones!. But what is tatting if you can’t snack from time to time, and CHOCOLATE is always the best. Nancy sent some very special Idaho chocolates the likes of which this country girl had never seen! Every heard of a candy called “Idaho spuds?” Well it’s De-Lish! and if you every find an “Old Faithful” candy, best grab it while you can! Yum! Thank you Nancy! Your thoughtfulness and gift are very much appreciated. If I am able to make it back to Shuttlebirds in Spokane, WA, I hope to either see you there or see you along the way! The Deck the Trees event at the Monte Vista Hotel has become a new tradition in Black Mountain that has helped benefit the Swannanoa Valley for 7 years now. We have participated in all the previous “Deck the Trees” and this year was to be no exception. As a group, we had originally planned to create some “easy” pattern like Diane Cademartori’s “ice drop” pattern thinking we could really fill in a six foot tree with something like that. But this year’s theme turned out to be “There are Angels Among Us” and we knew the direction we should take. 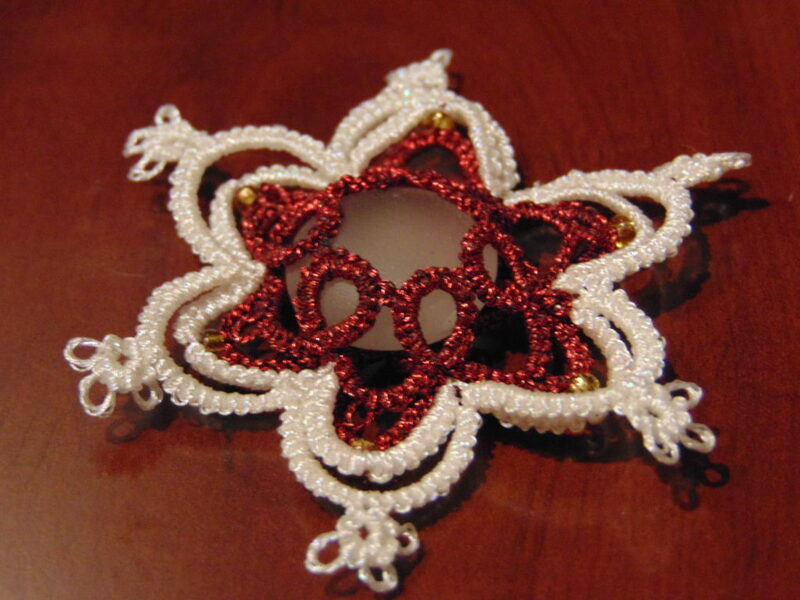 Angel patterns are relatively easy to find in the tatting world and with pattern greats like Marie Smith, Martha Ess, Sharren Morgan, Renata Niemczyk (remember to hit the translate button in your browser – it’s not written in English!) and Ineke Kubuiperij, patterns range from simple creations to complex designs. 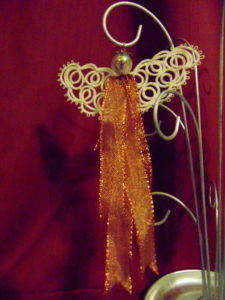 It didn’t hurt any that several of the tatting conferences around the US and Canada had hosted events with Angel themes as well. So this year the Tatted Tree at the Monte Vista was graced with 20 new angels of various patterns. That’s quite a feat for a small group. With a theme like that we weren’t sure how we could compare with the artistic talents of groups like the Girl Scouts, the Black Mountain Fire Department, the Swannanoa Valley Fine Arts League and Black Mountain Swannanoa Center for the Arts. But we wanted to find a way. Through these past few years, there have only been 2 groups who have been present at all the “Deck the Trees” events: Stephanie Wilder’s Chifferobe Store at the corner of Cherry and Sutton in Downtown Black Mountain and us. So it was fitting to honor all the participants who through the years had helped raise more than $60,000 for The Swannanoa Valley Christian Ministries. And that’s exactly what we did. There have been 94 participants and we added the names to our angels and snowflakes and garland for the event. In the end, the tatted tree was the most fully-decorated we have ever put together. Every person who has ever participated with us is thanked and appreciated beyond belief! It’s been quite a road from the humble 2 foot tree of 2012 to the richly decorated 6 foot tree of 2018. There are truly Angels everywhere! Oh, and if you noticed a typographical error in the sign to the left of the tree: the word “Angles” – well that was corrected after the photo was taken. There may be ANGELS Among Us, but not all of them know how to spell! Good intentions abound in the blogging world. No exception here. It’s been a race with the Time Lords (for the Dr. Who Fans) getting ready for the 2018 Tat Days Convention, then attending the Vance Birthplace Fall Folk Festival where 3 of the members of the Thread Bears Tatting group gave demonstrations of tatting, and then there was a special treat! I was able to purchase a ticket to attend this year’s public event at Hart Square Village. Follow the link to learn more about the Village, its founder Dr. Bob Hart as well as its mission and events. It’s difficult to find authentic Appalachian log cabins because so many of them have fallen into neglect and rotted or were bulldozed in the name of progress. Not only am I a ta tter, but I am a videographer and historian. So re-enactments are special, especially when they might apply to other aspects of my life. I have wanted to attend the event at Hart Square for several years. 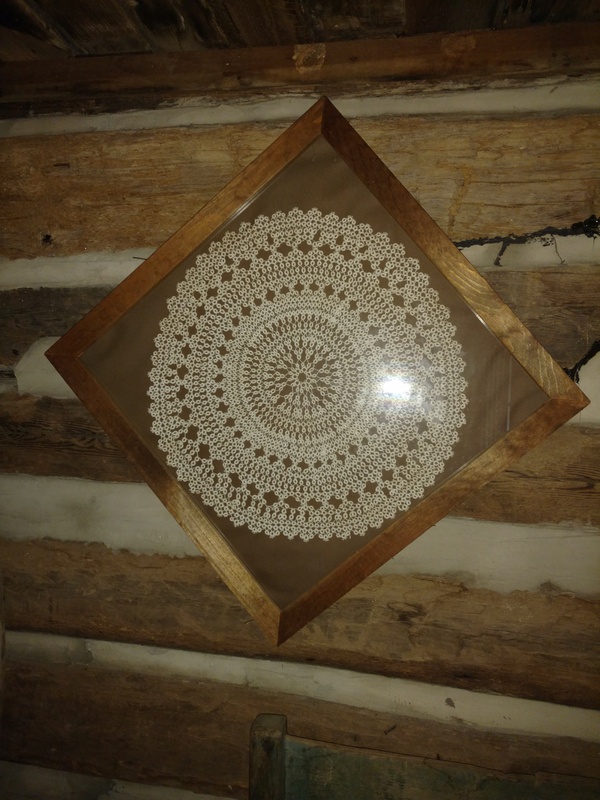 A friend brought me a photo he had taken of a doily in one of the cabins that he thought was a tatted piece. The image was of such poor quality that I could not tell. So I determined to go to see for myself. The all-ring motif is unmistakable! The cabin was built in 1850, yes, but it’s doubtful that the doily dates that far back. It’s also not clear if it is made from linen (flax) or from cotton. Flax was grown in that part of the world and cotton was not a local crop having to come from lowlands closer to the piedmont – Hart Square Village is located in the foothills not far from Newton, NC the county seat of Catawba county. Among the re-inactors present were folks scutching flax, and spinning the fibers into threads. There was also a bobbin lacer and after a wandering the grounds a while longer, I found 2 ladies who were tatting. I’m not sure their clothing was consistent with the times when Appalachian women were tatting. 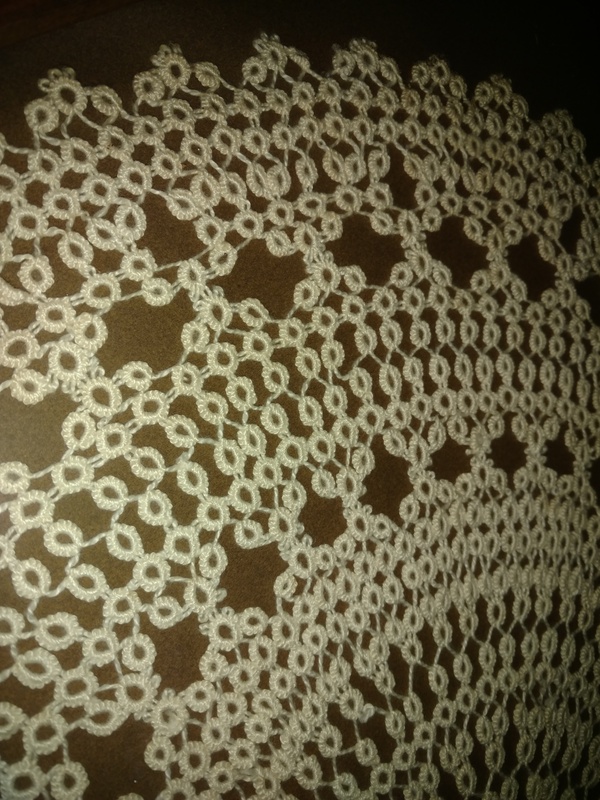 While I know tatting had reached the Southern women of Atlanta by the time of the American Civil War (it’s referred to in “Gone With the Wind”), Mountain Women were a bit behind the times, so I don’t think many women were tatting until into the 20th century. This would be hard to prove if it were not for the fact that Anne C. Orr wasn’t writing down cross-stitch, quilt, knitting, crochet and tatting patterns for Southern Woman Magazine until well after 1900. 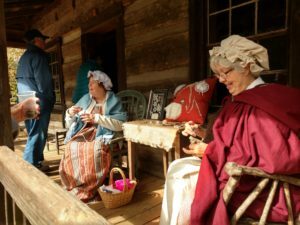 It’s doubtful that given the hard life of Southern Appalachian farm women after 1865, much time would be devoted to endeavors such as tatting or lace-making until times improved – closer to the end of the 19th century. 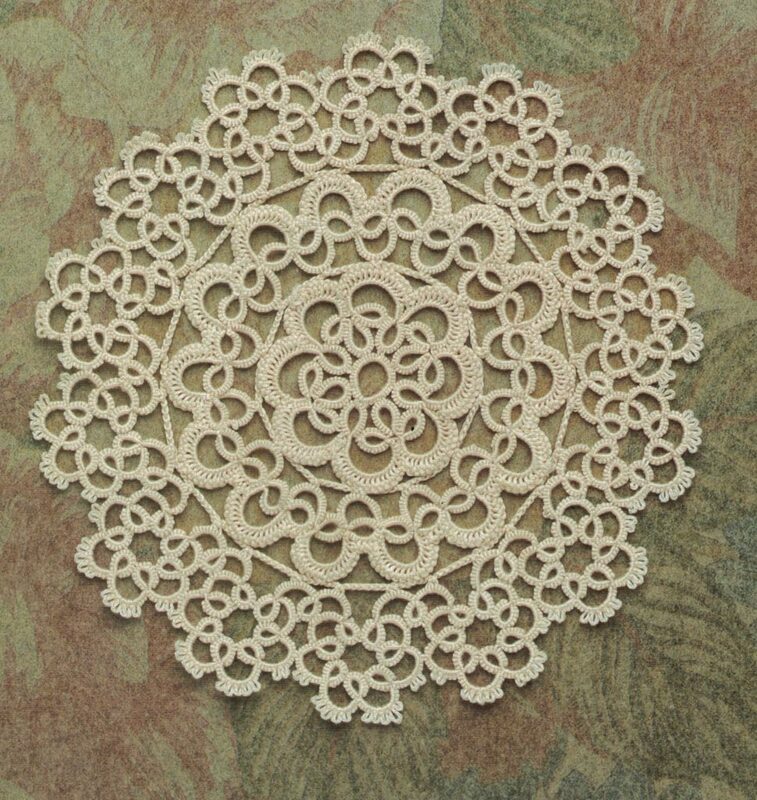 Written patterns weren’t necessary, of course, but it’s too hard to know how wide-spread tatting was in the mountains and foothills between 1860 and 1890. 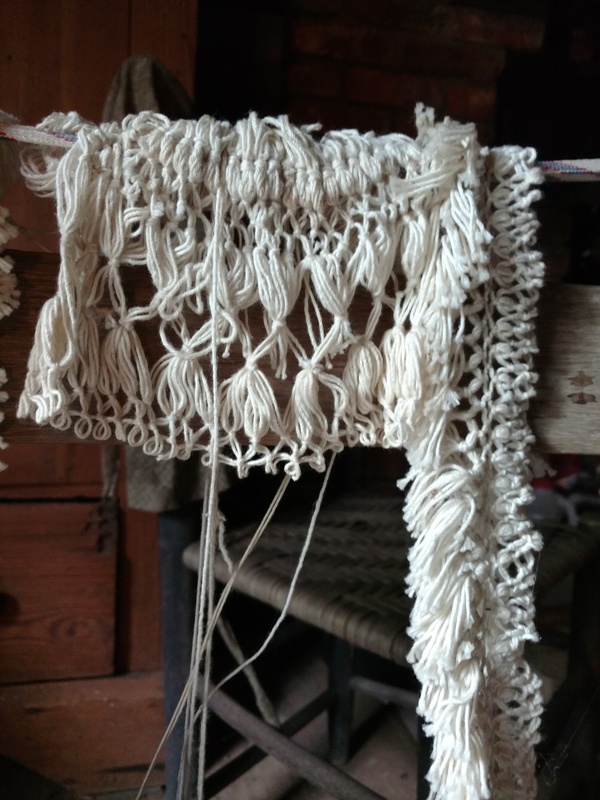 Be that as it may, it was great fun to see the historic aspects of fiber arts – spinning, weaving, bobbing lace and tatting – portrayed so prominently. There were also several examples of knotwork present at the Hoyle cabin the likes of which I had never before seen. . . The threads were rather coarse, almost like the cotton twine of a similar weight to what one might find for binding the legs of a Thanksgiving roasting turkey. There were at least 2 examples draped over a chair and another sewn to the hem of a bed coverlet. This photo is only one of the 3 designs present in the cabin. Knotwork is rather rare to find as a hand created item. This was a find, indeed!